Rent Noise At Work (NAW V2019) type C for 1 year ! Rent the Noise At Work is a powerful tool for visualization and reporting of occupational noise. Key words are fit for purpose, easy to use and cost efficient. It allows quick and professional mapping of your indoor and outdoor noise measurements. 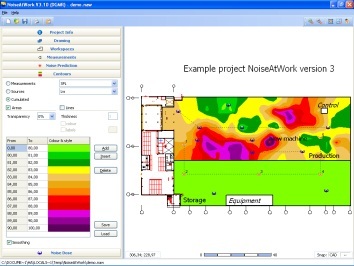 Fit for purpose Noise At Work is dedicated, fit for purpose software with exactly the options that you really need. Easy to use Noise At Work is extremely easy to use and is fully interactive. It can be learned within minutes. After watching the 5 minute demonstration video you can start mapping the noise levels at your factory. Cost efficient Noise At Work is very cost efficient. It will significantly reduce the time you normally spend on getting your measurement maps done. Discounts are available for multiple licenses. This is the basic version including the option for noise prediction calculation (NAW type C), perfect for creating occupational noise maps. For Noise Dose calculations and Noise Control modules, please have a look at type D.